Lin Ratanak Angkor is a superior 4 star hotel with 104 Superior, Deluxe and Suite rooms. 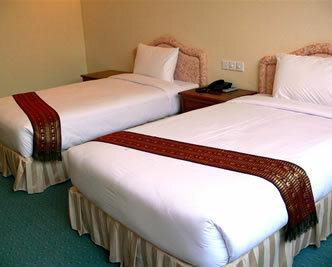 Hotel is located in the heart of Siem Reap town. A sanctuary hotel for tourist and corporate guests who expect excellent hospitality and efficient services. So you are on business or pleasure, Lin Ratanak Angkor Hotel is a medium luxurious hotel. Elegantly finished to provide you comfortable stay after come back from the magnificent temples of Angkor Wat and enjoy with facilities and traditional Cambodian hospitalities of hotel welcome. Conveniently located in in Siem Reap town and walking distance to see Cambodian real living surrounding the hotel. Only 10 minutes to old market, 10 minutes to Phsar Leu as well as major shopping and restaurant outlets. Our hotel only 15 minutes drive from Siem Reap Airport and only 15 minutes drive to the heritage temple of Angkor Wat. Our friendly staff will be waiting to assist to the needs and requirements of all guests to ensure a memorable stay at Lin Ratanak Angkor Hotel and their visit to the legendary Angkor Wat temple. Lin Ratanak Angkor Hotel in larger map.